GardenLady.com | I Love Gaultheria Procumbens, aka the Native Wintergreen. I Love Gaultheria Procumbens, aka the Native Wintergreen. How many plants are native, edible, pretty all winter, provide food for wildlife and available for planting in pots, urns and window boxes? I'm thinking of one: Gaultheria procumbens. 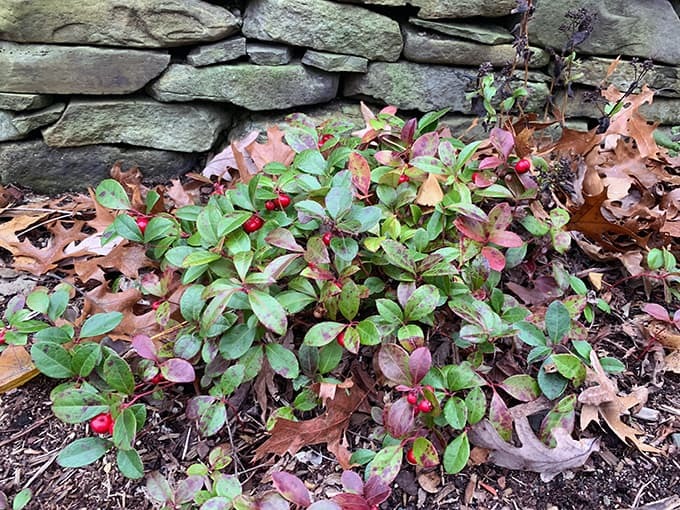 17 Nov I Love Gaultheria Procumbens, aka the Native Wintergreen. 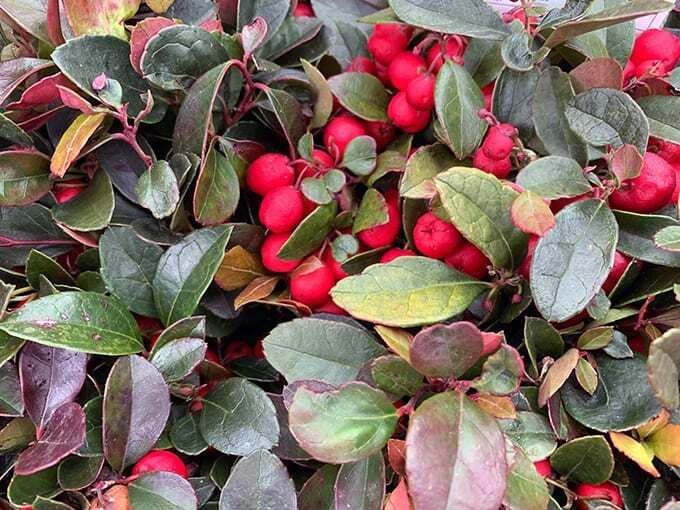 Name: Gaultheria procumbens aka wintergreen. Type of Plant: A low-growing, evergreen groundcover that is native to the Northeast. Why I Love/Hate this plant: This is an interesting plant. First of all, it’s useful at this time of year when many garden centers sell it as a plant that can be used in urns, window-boxes, and pots. The leaves range from bright green to purple, and the plants are filled with big, red berries. 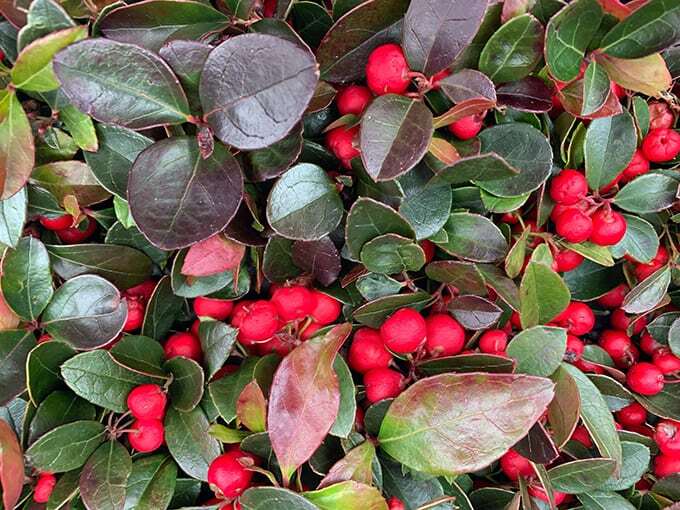 But beyond the holidays, wintergreen is a great winter food for wildlife, from squirrels and deer to assorted birds. People sometimes put the berries and leaves in a jar for three days, and then boil it up for tea. Historically the plant has been used to make oil of wintergreen, which has been used in chewing gum, candies, pastries, and toothpaste. It was used medicinally to make poultices for arthritis relief. A Word to the Wise: When you buy a plant from the garden center the berries are huge. That’s because they were raised at a professional grower where they were given the optimum amounts of water and fertilizer. Once you plant this in a shady garden, the berries will normally be a bit smaller. These are wintergreen plants at the garden center, ready for winter containers. Combine these with mini-evergreens for a stylish display that can be planted in the garden next spring. See how the leaves vary from green to purple and red? Here is a winter green plant in my garden. It was a small one a couple years ago, but it has spread because it’s happy in this shady location. Notice how the berries are smaller than the ones that were raised by professional growers.